Beyond knowing how to compare tradeoffs between different areas of impact, more fundamentally, we recognize that the challenge of sustainability goes far beyond simple material and energy efficiency. A great deal of the impact we have as humans is tied to our behaviors and expectations. Likewise, the impacts we generate as a society don't only derive from the objects we have, but how, when, and why we use them. To better understand this approach, we can imagine our society as a complex machine with various cogs and gears spinning within it to keep it running. 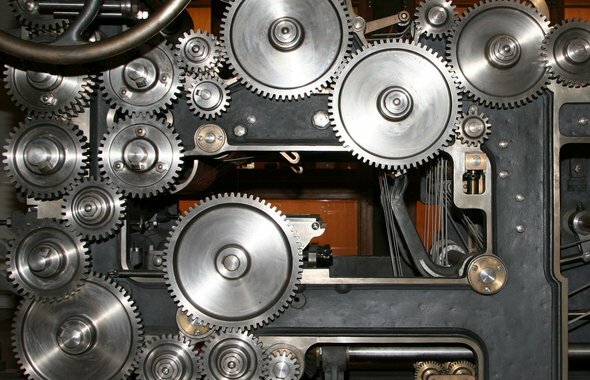 These cogs and gears are our everyday technologies – cars, planes, lightbulbs, computers. They move people from place to place, facilitate communication, allow us to read after dark, travel around the world, and perform many other amazing and useful functions. Ideally, we like to keep all of those, but without their negative impact. Currently, most environmental policies are focused on the level of these 'negative' objects. In other words, they are centered around finding cogs and wheels within the machine of our society that could be running a bit more efficiently, and making an effort to replace them with “better” versions. The system as a whole, its purpose, direction and impact, will not change if we just switch out cogs and gears. It isn't the cogs that need upgrading. The configuration of the overall system is inefficient. We need to redesign the machine itself. We need to begin functioning differently within our societies, changing the patterns of our behavior, and reducing our impact by orders of magnitude, not just by tiny increments. While focusing on the object-level, the benefits of environmental solutions are often not seen, as they take place on a system-wide level. Using a systems approach to develop a transition path towards this evolution of society carries with it a great number of advantages. These advantages often play out on societal, economic and ecological levels, maintain their effecivity in the long term, and are perfectly scalable. For this, we have developed the systems methodology, called Symbiosis in Development (SiD). It allows us to consider social, economic, and environmental trade-offs in a complete and structured fashion. To achieve the succesful design of systems solutions, we need an integrated approach, where all disciplines work together, where information is freely shared among parties, where broad perspectives are combined with specialized microscopes. That is what is unique about the SiD approach: it is on this network level of intervention that it plays its greatest role. When doing any kind of analysis of a sustainability-related question, we use the SiD categories represented in ELSIA: Energy and materials, Life, Society and culture, Individuals, and Actions. We look at all of the potential consequences of any decision or intervention along all of these planes, and choose paths of action that reconfigure the system to optimize as many of these areas as possible. We evaluate these individual actions and effects to the level of the system. We look wether or not the response of the system increases its resilience, its autonomy and equity. We observe the system's nature, and its behaviour, rather than trying to figure out the details of every single part that makes it go. This is not an easy task, nor are the answers and questions always clear. But without fail does this approach result in better solutions, better ideas, more insight and viable and inspiring pathways towards a brighter future.